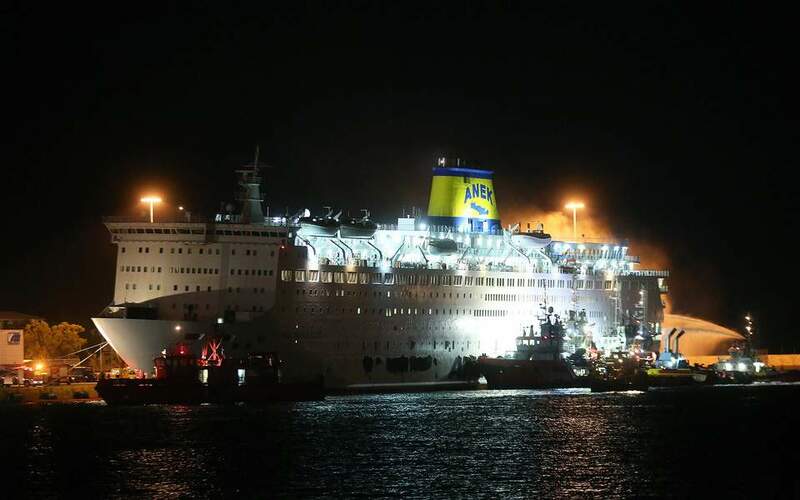 A passenger ferry with 1,016 people onboard returned safely to the port of Piraeus in the early hours on Wednesday after it reported a fire while en route to Crete, the coast guard said. There were no immediate reports of injuries, a coast guard official said. The Eleftherios Venizelos, carrying 875 passengers and 141 crew, was sailing off the island of Hydra when it notified the coast guard around midnight that a car parking compartment had caught fire. The vessel had set sail at 10 p.m. The ANEK Lines vessel was escorted back to Piraeus after authorities scrambled air and sea assets to the area. Two firefighting boats, ten tenders, 48 firefighters and two emergency response teams were involved in the operation. At Piraeus a witness saw passengers in lifejackets walking down a sideway stair, while smoke billowed out of the ship. Firefighters were deployed at the pier. Disembarkation of all passengers was completed around 7.00 a.m. Travelers were put up in local hotels by the ferry operator while a replacement vessel is expected to go into service on the route. In a statement, ferry operator ANEK said the fire broke out at 11.45 p.m. in the parking deck for trucks.